Country Restrictions: Hungary, Romania, the Republic of Cyprus, Italy, Israel, Turkey, the German, France, Mexico, Spain, Denmark, Belgium, USA. Company: SlotsMagic casino is a brand operated by Universe Entertainment Services Malta Limited (C 50024). 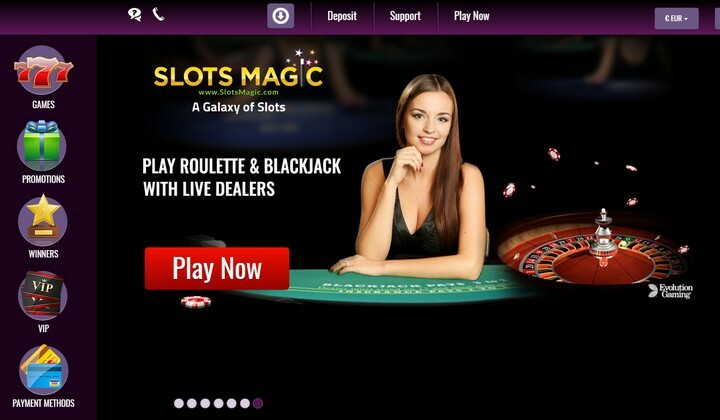 If you’re a player who loves online slots, checking out SlotsMagic Casino is definitely something that you’ll want to do. With the slogan “A Galaxy of Slots” this online casino doesn’t hold back when it comes to offering an incredible array of premium online slot games entertainment. In fact, SlotsMagic boasts over 600 slots titles from an array of the industry’s leading software developers and adds new games all the time to both its desktop and mobile casino platforms. More than just video slot games, this iGaming destination also offers other table games, a live casino and an incredible Welcome Package, daily rewards and a number of player-friendly features. For instance, you can benefit from no wagering on free spins, fast payouts and low wagering on bonuses! Powered by SkillOnNet, SlosMagic.com is licensed and regulated by the Malta Gaming Authority and was established in 2014. This online casino supports multiple languages, multiple currencies, and safeguards player privacy and sensitive data with 128-bit SSL encryption technology. Customer support functions 24/7 and software is available for download, Instant Play (Flash), and via HTML5 for Android and iOS mobile devices (smartphones and tablets). The casino games experience at SlotsMagic is one that will appeal to players of all skill levels and interests. It’s more than 600+ games that fill its database come from many of the industry’s most talented and innovative casino software developers. In addition to featuring exclusive and 3D content from popular SkillOnNet, you’ll also discover hot titles from NetEnt, Microgaming, WMS, NextGen Gaming, GVG, Bally Technologies, Amaya, Barcrest, and Merkur Gaming among others. Choose from a myriad of slots that span from classic 3 reels to 5 reel and 50 payline bonus slots. You’ll also find a slew of epic 3D slots, popular licensed online slot games and progressive slots with mind-blowing jackpots! Beyond the spinning reels, you can challenge yourself with different video poker titles and some unique entertainment that you won’t find at many other casinos, including arcade-style games like The Big Wheel, Doubles Heaven, and Hi Lo Cards. Don’t worry table and card game lovers a variety of this type of entertainment is also available, such as Baccarat, Craps, and Caribbean Poker as well as several variants of roulette and blackjack. Live versions of roulette, baccarat, and blackjack can also be experienced in SlotsMagic’s live casino, which is powered by Evolution Gaming, XPG and Extreme. There are ten currency options and a wide range of SlotsMagic Casino payment methods that include credit and debit cards, prepaid cards, e-wallets, and bank transfers. Some methods offered are even country-specific to tailor to the needs of their players who come from all over the world. To keep deposits and withdrawals as fast and convenient as possible, SlotsMagic offers banking options from over 30 secure and reliable payments services. It’s most popular deposit options include Visa, MasterCard, Neteller, Skrill, Paysafecard and wire transfer. With the exception of wire transfer, each method allows you to make deposits instantly, which means you can start playing the games you love faster. As for withdrawals, the most popular methods include credit cards, wire transfers, Paysafecard, Neteller, Skrill, EcoPayz and PayPal. While processing times vary depending on the payment methods and may take up to 7 business days, certain withdrawal methods like Neteller and Paysafecard occur on the same day, giving you super-fast payouts! When you signup at SlotsMagic the first reward you’ll receive is 10 Free Spins on SkillOnNet’s 3D Ninja Master slot with no deposit required. From there, you can move on to claiming a highly generous Welcome Package that awards €400 casino bonus + 200 free spins on three amazing NetEnt slots over your first three deposits. On your first deposit you can get 100% up to €150 and 50 free spins on Starburst. Claim 50% up to €125 and get 50 free spins on Steam Tower on your second deposit. Your third deposit gives you the chance to score 50% up to €125 and gives you 100 free spins on Gonzo's Quest! To claim this great welcome offer, use bonus code: MAGIC for each deposit to get the corresponding bonus and free spins (standard bonus terms apply). The Welcome Package offered at SlotsMagic is outstanding for two main reasons. The first is that there is a very low 25x wagering on bonuses. 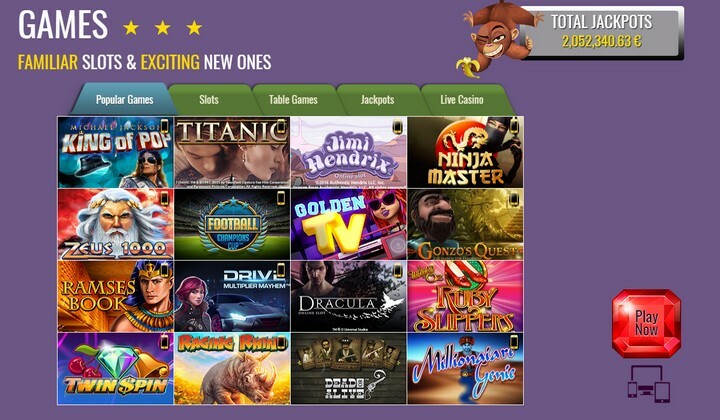 Secondly – and most impressive – there is absolutely no wagering on free spins. This means that any money you win from free spins is yours immediately to do with as you please. You can continue to play real-money games with it or you can withdraw it right away. This applies, even if another bonus is active! Every player at SlotsMagic online casino can take part in the VIP Lounge. There are six levels to this loyalty program including Bronze, Silver, Gold, Platinum, Diamond and Red Diamond. Your level is determined by the number of VIP points you have. The more points you collect, the higher your level and the more exclusive bonuses and perks you can expect to enjoy. VIP points are earned by playing your favourite casino games for real money. The types of rewards that you might enjoy as a SlotsMagic VIP include: faster payouts, VIP account manager, birthday bonus, free bonuses, cashback, regular invitation to exclusive events and more. As an added bonus, players have the option to convert their VIP points into cash and points converted into cash are wager-free. SlotsMagic offers exciting promotions for all its players, regardless of whether they’re new or not. Their most exciting regular promotional offer is a unique perk called Daily Picks. This special promo gives you the opportunity to select a new offer every day when you login to your account. 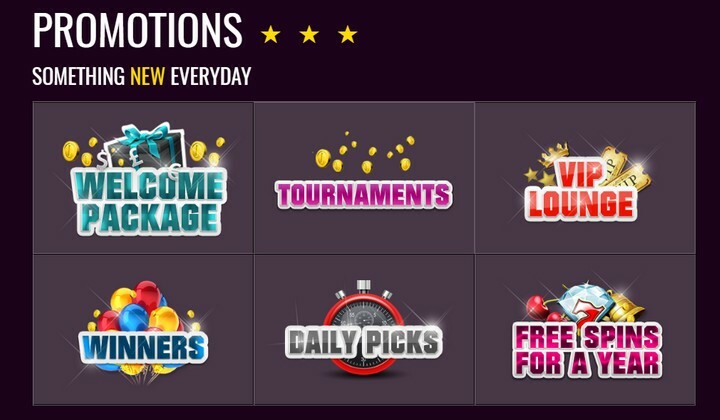 All you have to do is head to your Daily Picks section, and there will be multiple offers for you to select, such as a deposit bonus, reload bonus, a big one-off bonus, Mega Spins or something else. Offers are different all the time and you’ll always have the option to pick one per day, which is fantastic if you love the idea of being able to claim rewards on a daily basis! SlotsMagic customer support is available 24 hours a day, 7 days a week. The support team is quick, friendly, professional and available in multiple languages. You will also find a detailed FAQ section, which is a great self-help tool for players who are seeking answers to commonly asked questions.